The first rolling DNA motor — the biological equivalent of the invention of the wheel for the field of DNA machines — is headed from its origins in an Emory University chemistry lab to the finals of the 2016 Collegiate Inventors Competition in Washington D.C.
Kevin Yehl and Aaron Blanchard make up one of six teams of graduate students who will be flown to the finals in early November. 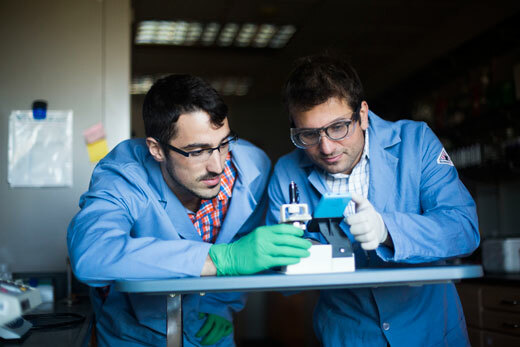 Yehl and Blanchard developed the DNA motor (dubbed Rolosense), and its application as a chemical sensor, in the laboratory of their adviser, Emory chemist Khalid Salaita. Blanchard is a PhD student in Emory's Laney Graduate School and the Coulter Department of Biomedical Engineering (BME) at Georgia Tech and Emory, while Yehl recently graduated from Laney and the BME department. The entries of the elite student teams represent the most promising inventions from U.S. universities. “Their ideas will shape the future,” wrote Michael Oister, CEO of the National Inventors Hall of Fame, in a letter announcing the finalists. The Collegiate Inventors Competition annually gives out about $100,000 in cash prizes and is considered the foremost program in the country encouraging invention and creativity in undergraduate and graduate students. The competition also promotes entrepreneurship, by rewarding ideas that hold value for society. The Rolosense is 1,000 times faster than any other synthetic DNA motor. Its speed means a simple iPhone microscope can capture its movement through video, giving it potential for real-world applications, such as disease diagnostics. "It's exciting," Yehl says. "Previous winners have gone on to start companies with their inventions and become successful scientists. It will be great to get feedback from the judges on the Rolosense." The judges will include inductees to the National Inventors Hall of Fame, officials from the U.S. Patent and Trademark Office, and scientists from the global healthcare firm AbbVie. Some of the best discoveries involve serendipity, and that was the case for the Rolosense. Yehl was working last year as a post-doctoral fellow in the Salaita lab, which specializes in visualizing and measuring mechanical forces at the nano-scale. He was conducting experiments using enzymatic nano-particles — micron-sized glass spheres. “We were originally just interested in understanding the properties of enzymes when they’re confined to a surface,” Yehl says. During the experiments, however, he learned by accident that the nano-particles roll. That gave him the idea of constructing a rolling DNA-based motor using the glass spheres. So far, however, mankind’s efforts have fallen far short of nature’s myosin, which speeds effortlessly about its biological errands. Some synthetic nano-walkers move on two legs. They are essentially enzymes made of DNA, powered by the fuel RNA. These nano-walkers tend to be extremely unstable, due to the high levels of Brownian motion at the nano-scale. Other versions with four, and even six, legs have proved more stable, but much slower. In fact, their pace is glacial: A four-legged DNA-based motor would need about 20 years to move one centimeter. The Rolosense design mows over these limitations. Hundreds of DNA strands, or “legs,” are allowed to bind to the sphere. These DNA legs are placed on a glass slide coated with the reactant: RNA.